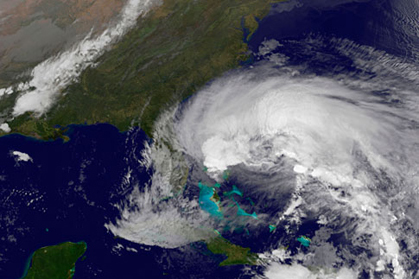 Hurricane Sandy is barreling up the East Coast as I write and it is surely an unexpected nightmare for both Barack Obama and Mitt Romney. They had probably prepared for every eventuality this last full week of campaigning and thought long and hard of every possible new wrinkle in a close fought race. Except for a hurricane barreling up the East Coast sending everyone fleeing coastal areas like rats. Just imagine if it had hit a week later and interfered with voting in the presidential election? How will President Obama and Mitt Romney play it? It seems to offer both men a poisoned chalice. Sure Obama can look presidential and comforter in chief when the storm hits and he will almost certainly visit a disaster areas in its aftermath. But he has to be extremely careful not to play politics overtly with a possible tragedy. Remember George Bush and his disastrous reaction to Hurricane Katrina in New Orleans, which dogged his presidency forever? In addition, if early voting is hit in states that are toss ups that are in the path of the storm, it will disproportionately affect his voters who have been winning the early voting turnout. For Mitt Romney, who had been experiencing a boost in recent national polls but still trails in key battlegrounds, the storm could have the effect freezing the race for the length of the storm. He also knows it also gives his opponent the opportunity to look presidential and Obama has impressed on such occasions like in the aftermath of the shooting of Congresswoman Giffords. So neither man will be happy with the weather Gods for throwing one yet more unpredictable X factor into the final week of campaigning. But that’s what they face.